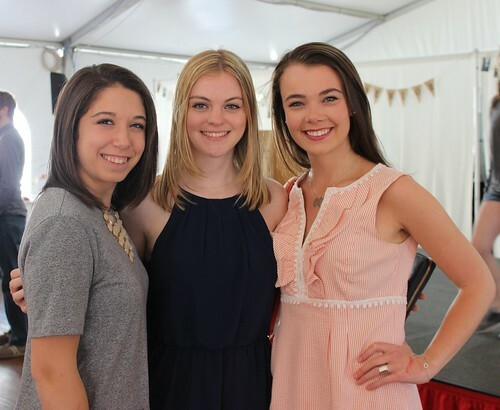 Last week, Fairfield University hosted its annual Senior Week, a long-standing tradition when seniors participate in a week-long series of events prior to Commencement. The week provides an opportunity for the graduating class to strengthen friendships, reflect on their years together, and celebrate their accomplishments as they prepare for the future. This year's theme was Once a Stag, Always a Stag in honor of the University’s 75th Anniversary celebration. Colleen Wilson, associate director of Student Engagement, and the Senior Week team, thoughtfully planned eight anniversary-themed events that took place both on and off campus. The week kicked off with a blessing at a special Mass for the class. At Senior Soiree, students invited their favorite faculty and staff members to socialize one last time, while being transported to the 1940s, Fairfield’s founding years. On Day of Service, seniors helped Al’s Angels sort and wrap over 1,000 toys in early preparation for the holiday season. Every wrapped toy will be provided to a child battling cancer, rare blood disease, or severe financial hardship. Additional Senior Week events included Adventure Park, where students explored 11 trails, 21 zip lines, and 161 challenge bridges, and a Picnic Beach Party, when students enjoyed a relaxing day off campus with a variety of recreational activities including swimming, volleyball, canoeing, rock climbing, mini-golf, and a pie-eating contest. The week concluded with the Family Dance. Family and friends joined the Class of 2017 for unlimited hors d’oeuvres, dancing, and live band entertainment at three fun-filled venues on campus.